Kelly has admired the profession of Firefighting for a long time. It is to her, the noblest of professions. Firefighters run into burning buildings when others are running out. They risk their lives to save others whom they do not know. No matter what your job, gender or social status, they’re here to risk their lives to save yours. She wanted to do something to show them and ALL firefighters that what they do is important... more than any celebrity or sports figure celebrated in pop culture. She wanted to give back in a meaningful way, but didn’t know how. Then it came to her. She decided to create a tartan honoring ALL firefighters for what they do every day. The firefighters Kelly has spoken with tell her, they’re “just doing their job”. To her, they’re doing the most important job and deserve all the help that we can give to them. Kelly created the Firefighter’s Memorial Tartan as a way to raise money for firefighter’s charities. USA Kilts is donating 10% of every kilt made (that’s a majority of our labor costs per kilt) to the Leary Firefighters Foundation. Please note that we’re not “inflating the price” of these kilts... we are charging the standard price for our kilts and donating the money out of our own pockets. To every firefighter (or family member of one) who reads this message, thank you. Thank you from the bottom of our hearts. We hope the money we donate helps to train and save the lives of those who are here to save ours. USA Kilts is proud to offer a full range of kilts and kilt accessories just for Firefighters, including the USA Kilts exclusive firefighter tartan, ‘Firefighters Memorial’. This is our humble attempt to create a lasting 9/11 tribute tartan. Many of our customers refer to it as the “343 tartan” because of the stripe pattern we included to remember the first responders at WTC. 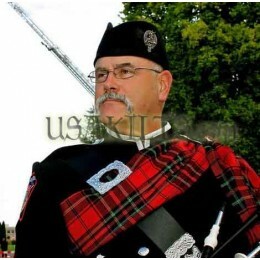 A portion of all sales of Firefighters Memorial tartan products go to the Leary Firefighters Foundation. 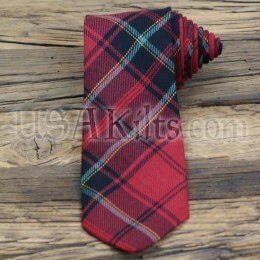 And the fire fighter memorial tartan is just the beginning. Whether you are an individual firefighter or a member of a departmental pipe band or honor guard, we have the right accessories to show your firefighter support and firefighter pride. 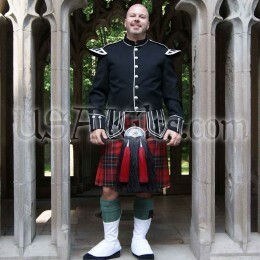 Our firefighter tartan kilt accessories all feature the Maltese Cross with black, red and chrome accents and come in a variety of products -- buckles, kilt pins and casual day sporrans all the way up to horsehair parade sporrans. Each is crafted with care in Scotland. All of these products are exclusive to USA Kilts. Please do not accept substitutes.